Hawaii is the only place in the United States where humpback whales mate, calve, and nurse their young. These gentle giants find Hawaii’s warm waters and lack of natural predators ideal. The humpback whale is an endangered species as a result of commercial whaling, which has reduced the population significantly worldwide. In 1993, 4,000 of the 6,000 remaining whales in the North Pacific Ocean came to Hawaii. Thankfully, since the international ban on commercial whaling, the North Pacific humpback whale populations are now up to around 21,000, and at least half to two-thirds of these humpbacks frequent Hawaiian waters during the winter months. The whales feed during the summer months in the cool, nutrient-rich northern waters of Alaska, then take the 3,000-mile trek south to Hawaii, traveling continuously at three to seven miles per hour until they reach the warmer waters. In Hawaii, the yearly whale migration is considered a homecoming, since humpback calves are born in Hawaii. The gentle giants are treated with great respect and are believed to be aumakua (family guardians) by some Native Hawaiians. Whales have plate-like bristles known as baleen in their mouths instead of teeth, and they feed on krill and schools of small fish such as herring. At birth, whale calves can weigh up to 3,000 pounds and are between 10 and 15 feet in length. An adult humpback can grow to more than 40 feet in length and weigh over 40 tons. The Hawaiian Islands Humpback Whale National Marine Sanctuary lies within the shallow warm waters surrounding the main Hawaiian Islands and was created by Congress in 1992 to protect humpback whales and their habitat in Hawaii through education, research, and resource management activities; some of which include public surveys. Residents and visitors now have the opportunity to actively participate in evaluating numbers of humpback whales. A special “whale count” is held the last Saturday of January, February, and March on the islands of Oahu, Kauai, and Hawaii. Visitors to the Hawaiian Islands can enjoy sighting these magnificent creatures from a land or sea vantage point between October and May each year, the peak of the season being from January to March. There are a variety of ways that you may see these ocean giants; the best way for close-up viewing (up to 100 yards away) is to take a boat tour or cruise, but whales can also be spotted from various locations on land. It is common to see whales daily just by visiting any Hawaiian beach and scanning the ocean for a distant splash or breach. However, for the best experience, we recommend a professionally guided whale-watching tour. 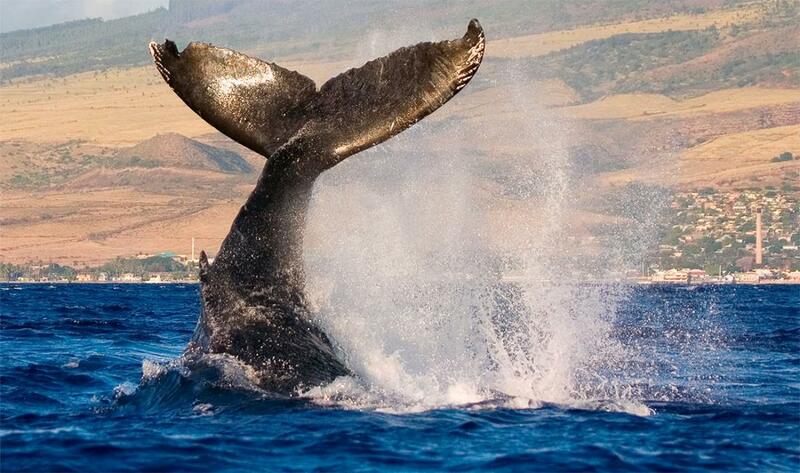 Maui is a top whale-watching spot for boat-based viewing; in fact, it is one of the best in the world. The majority of the whales that migrate to Hawaii bask in the warm, hospitable, and generally calm Maui waters. The whales just love the shallow Auau Channel that is situated between West Maui, Lanai, and Molokai. While Maui is the best location for humpback whale spotting, the other islands also see many whales in season. 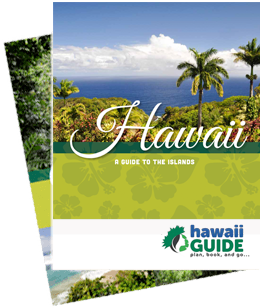 There are fabulous whale watching tours on Kauai, the island of Oahu, and off the shores of Big Island. On any boating adventure, there will be the opportunity to watch numerous whales displaying a variety of behaviors, such as the tail slap or pec slap (the whale will raise its tail fluke or fin and slap it on the surface of the water), which serve as communication signals. Other impressive acrobatic displays include spy hopping (the whale rises vertically with its head out of the water), blowing (the whale surfaces to breathe, shooting water out of its blowhole), and the famous breach - where the whale will launch itself out of the water, giving visitors the opportunity to see almost the entire body of the whale. Mothers can be seen breaching alongside their calves, which is a truly magnificent sight! By regulation, humpback whales cannot be approached closer than 100 yards, in respect of these endangered ocean creatures and for the safety of sightseers. Be sure to check the weather conditions before you plan your whale watching adventure, and remember to pack your sun protection gear, as well as your camera and binoculars for optimal spotting. However, you choose to view these magnificent creatures, your whale watching adventure in Hawaii will surely be a memorable experience. Spotting humpback whales are one of the best winter activities in Hawaii. We are proud to offer whale watching tours from Maui, Kauai, Oahu, and Big Island; so no matter which island you'll be visiting, you won't miss the opportunity to spot these amazing creatures. Be sure to book your tour well in advance, as they can fill up months ahead of time.